As the LA Times reported on March 2nd, one day after President Trump announced a plan to impose new tariffs on steel and aluminum, the White House, Congress, and those affected were left scrambling to figure out what these changes meant for their work and the overall US economy. Tariffs had not been a major discussion throughout the first months of 2018, causing a significant spike in dialogue in Congress. Here's a look at the shift in conversations around tariffs by members of Congress. 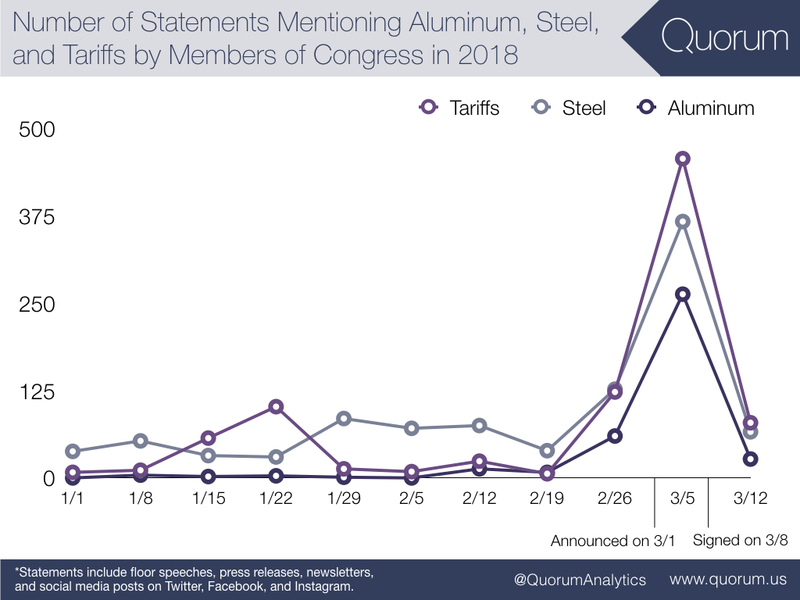 Mentions of tariff, steel, and aluminum increased an average of four times per day after March 1st. Dialogue spiked in mentions of tariffs, steel, aluminum, and trade war after March 1st, with a peak of 221 mentions on March 8th, the day that Trump announced the official rates that tariffs would increase to. Before March 1st, many of these terms saw nearly zero discussion in Congress. Eight of the ten most vocal members of Congress on Trump's tariffs are Republicans. 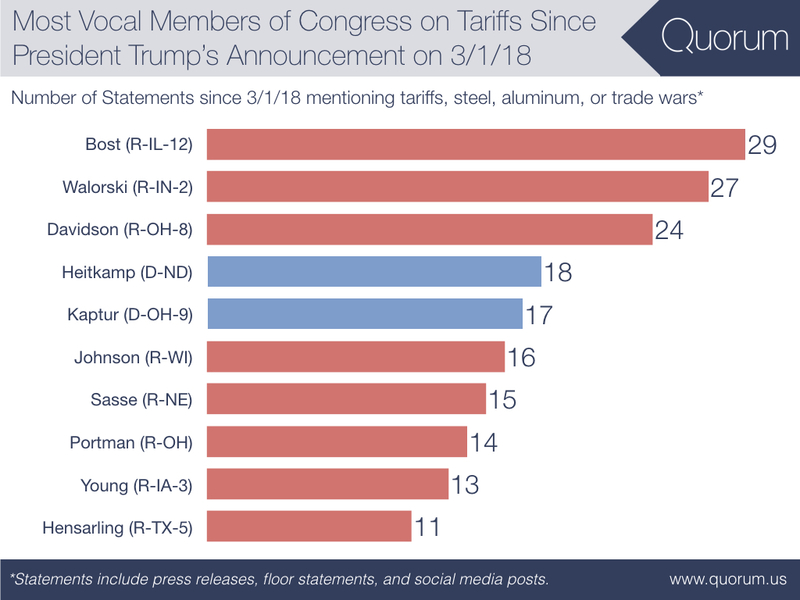 Rep. Bost (R-IL-12) has been the most vocal member of Congress on tariffs since President Trump's announcement on March 1st. Only two Democrats were represented in the top ten—Sen. Heitkamp (D-ND) and Rep. Kaptur (D-OH), with 18 and 17 mentions, respectively. 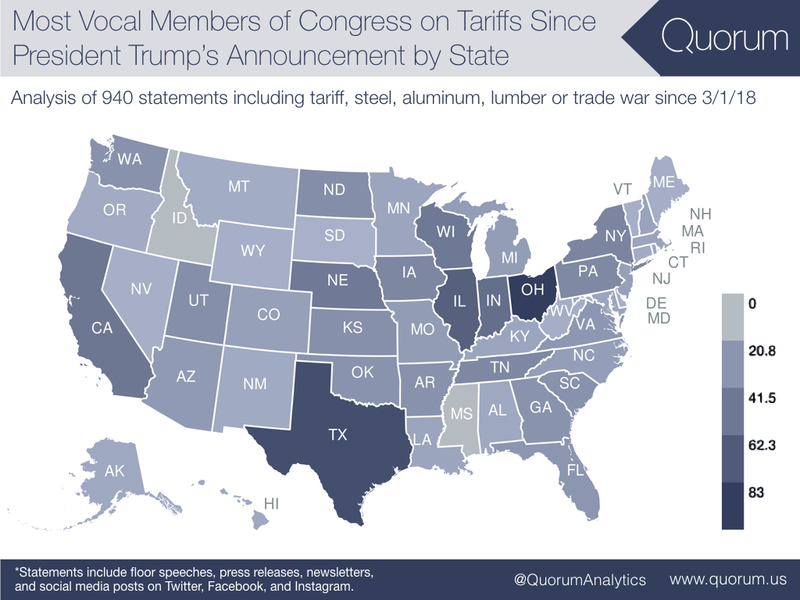 Legislators from Ohio have been the most vocal on the Trump's tariffs with 83 mentions. Much of the dialogue has been concentrated in the Rust Belt states which would be most affected by tariffs, though nearly every state has mentioned tariffs at some point since March 1. Texas, however, was the second most vocal with 71 mentions, and Illinois in third with 53 mentions of tariffs.